After two long 15-hour flights with a 5-hour layover between them, Klaus and Glenys arrived in Sydney, Australia. While they had previously spoke about their attendance at the Rotary International Convention, this presentation covered their month-long vacation in these beautiful countries. They were fortunate to arrive in Sydney during the festival of lights called VIVID which has beautiful and creative laser lights all over the city, the buildings, and the water. Sydney is a very modern and contemporary city with great train service that is simple to understand. From Sydney to the tropical climate of Cairns where they saw koala bears, kangaroos, crocodiles, and a 6 foot 160 pound dangerous cassowary bird where road signs alert the traveling public. Due to a storm the travelers did not get to see much of the Great Barrier Reef. They flew next to Brisbane to tour and while there, saw a kookaburra bird; Brisbane to Auckland, New Zealand where they saw many extinct volcanoes. Of great interest was a Maori Exhibit at the War Museum. They saw glowworm caves, black swans, geo-thermal geysers and mud pools, and an old gold mine (but no gold). Then back to Sydney for a brief stay before flying back home. They covered a lot of territory but had a wonderful vacation. Once back home, the cat is still punishing them for being gone so long! 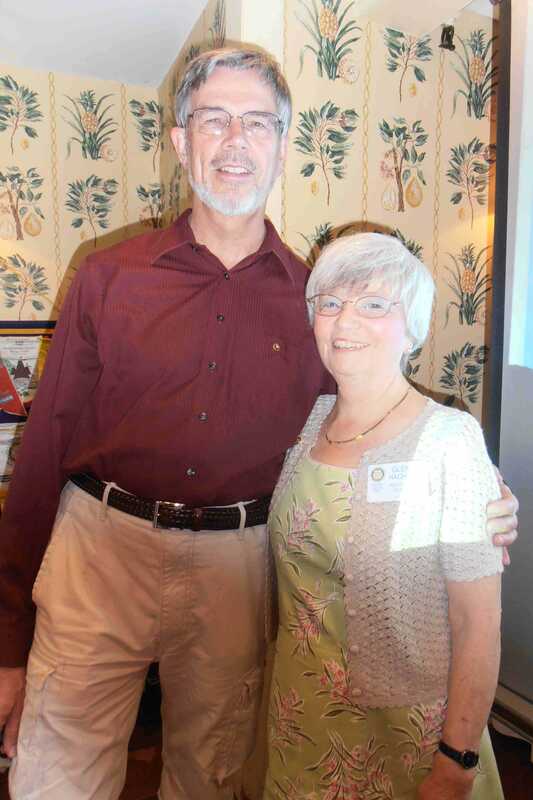 The Sturbridge Rotary Club donated over $46,000 to local charities, community and service projects. The funds for these donations were raised through a Foundation grant, a number of fundraising activities, and Club raffles held throughout the Rotary year. This would not be possible without the dedication of our members who work ‘countless’ hours on raising funds and on bringing community and international service projects to fruition. Benefactors include scholarships for seven Tantasqua students; leadership training for Tantasqua and Shepherd Hill students; food baskets coordinated through Catholic Charities; educational magazines and 500 dictionaries for elementary school students in Sturbridge, Brimfield, Holland, and Wales; maintenance of Sturbridge Rotary Park; Saint John Paul II Food Pantry in Southbridge; a NICview camera for the UMass Memorial Hospital Neonatal Intensive Care Unit; and an International Service Project in Kosovo providing surgical instruments to perform delicate reconstructive hand surgery. Special thanks go to the many businesses and vendors who have generously donated their products, space, knowledge and time to us. They include the Publick House, Yankee Spirits, Stop & Shop, Bob and Betty Christo, the Town of Sturbridge and Tom Chamberlain, Cornerstone Visual Communications, Designs Unlimited, Michael Beaudry Remodeling, Cohasse Country Club, Worcester State University, the Iowa National Guard, and you – the general public – for your continuing support of our charitable endeavors. Our membership is growing and therefore, we look forward to increasing our support for local charities, community and service projects in the coming 2014-2015 Rotary year.